@Julia – yeah, I think the science tap is no longer used. Thanks for the update. I was able to generate some output after training the network on papers related to finance/economics. However, my output makes pretty much no sense — aside from some words belonging to the training corpus, there’s no grammatical structure at all, almost no punctuation and it’s overall painful to read. One caveat is that because I was taking texts from PDFs, my training corpus had lines of different lengths (for example, one line had 10 words in it and the next line had 5 in the text editor). Would this be a problem though? I’ve experimented with different batch sizes and seq lengths, but haven’t noticed significant improvements. @Julia – line lengths shouldn’t make a difference, it will just learn those line-breaks too! How many MBs is your overall training text? It should be at least 1MB of plain text to get anything good. You could also try playing with the “temperature” setting mentioned in the tutorial. Thanks for your reply! My corpus is 5.1 MB. I do have some special characters too (which were footnotes or symbols in the PDF), but I’m surprised that there isn’t even any consistency in the punctuation. I’ll keep tweaking and see what I can get… just takes a long time to train but I can start with a smaller set. 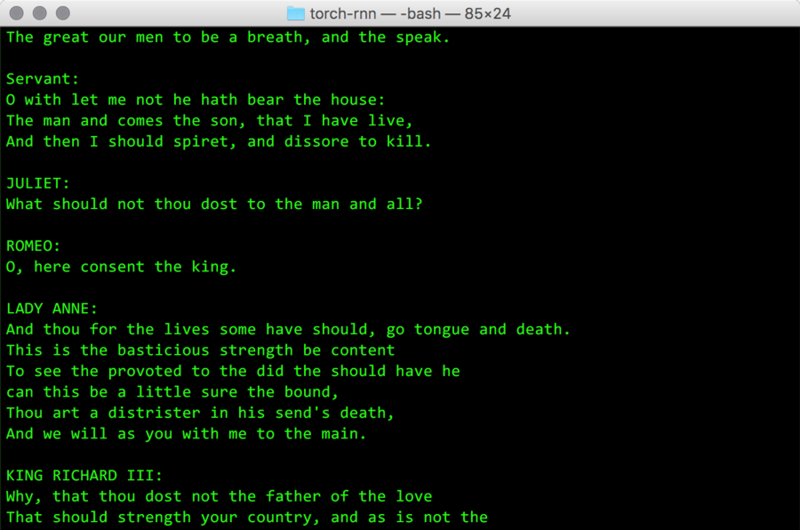 Sincere thanks to Jeff — and Tom & Zach in the comments — for helping me navigate torch-rnn, and its resultant errors, on MacOS (I’m running High Sierra, 10.13.4). Where to I write this part? In the Text Edit file or in Terminal? @Tyler – you add this to the .bash_profile file using a text editor. Your computer doesn’t know where to find the th command until you do that step. Thanks for the response on my last question. I have another. Updated 2 taps (homebrew/cask, homebrew/core). A) What does it mean that it has been “depreciated”? B) Where did the formulae migrate to? C) How does a novice like me move past this? Thanks for your patience and I appreciate any help you or the community can offer. @Tyler – I believe it should still work? That part of Homebrew has been removed, so I believe it’s just a warning. Were you able to continue with the install? MacBook (not pro, just macbook!) El Capitan 10.11.1, got it installed and working fine. Had to use Tom Schofield’s fix in comment 27 Feb 2017, about installing an older version of hdf5. and doesn’t have “;/usr/local/include/hdf5.h” which seems to be written there on install. Copying that file to that folder doesn’t work, as was suggested in another comment, but just removing that path is what made it work for me. @julia, regarding the punctuation, I found that the ‘temperature’ setting really affects the level of punctuation. At temperature of 1.0 my samples were generating realistic looking punctuation, mainly commas, full stops and paragraphs (which is what the training data had most of, with little other kinds of punctuation), but at temperatures of 0.6ish and below, there was no punctuation. @Finn — did you install the HDF5 library? I know that one is a bit of a challenge, so you might have to look through the comments here for tips. @Finn it looks like you are using version 1.10.x of HDF5, which is not compatible with torch-hdf5 (unless you are using a third-party modification of torch-hdf5 that has been updated to work with HDF5 1.10). You will need to specify version 1.8 of HDF5 when you install it with homebrew. I also ended up needing to edit the lua configuration file (at ~/torch/install/share/lua/5.1/hdf5/config.lua) and take out the second path in HDF5_INCLUDE_PATH (everything from and including the semicolon up to and NOT including the ” at the end of the line). I have posted more detail about these fixes in the blog post I linked above but my blog seems to be down at the moment hopefully it will be back up by the time you read this though! Hi, I’m completely new to this so I don’t know whether it’s related to my using High Sierra but up until the step 7 everything worked.